Suzuki delays planned Mondeo rival | What Car? The Suzuki Kizashi family car has been postponed due to the current economic downturn. The Mondeo rival had been shown in various forms at motor shows over the past two years, and was tipped to go into production in mid-2010. 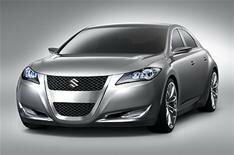 A Suzuki spokesman said: 'The Kizashi has been delayed, although in the longer-term it will probably still go on sale. Suzuki's international sales have been hit hard by the falling value of the Japanese yen, while sales have dipped in India, where it's the market leader.